Handshakes are a longstanding and accepted tradition in the business world, and numerous studies have shown that handshake etiquette plays a role in making a good first impression. In fact, favorable first impressions are tightly linked with the features of a “quality” handshake: strength, vigor, duration, eye contact, and completeness of grip. 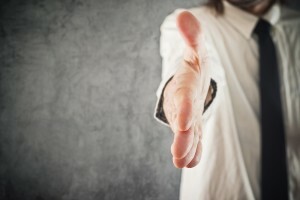 It is the only contact between two people that is considered to be professional, as handshakes are the official method of introduction between people in the business world. Bottom line: you should be the first to offer your hand. This demonstrates that you are a prepared and a confident individual who takes the first step. Initiating handshakes is appropriate for any public business setting, be it a job interview, business meeting, or as a gesture of thanks and appreciation. A high-quality handshake conveys information about your character that others use to make immediate judgments about your level of confidence, friendliness, and interest. Moreover, it is largely believed that people who offer their hand first are honest and more open minded than those who awkwardly wait for the interviewer to initiate contact. Make a good impression from the start by having positive and confident body language. The art of the handshake is all about proper form. The arm should be extended with your thumb up and palm facing slightly downward to more easily meet web to web. Next, when you shake someone’s hand, it is imperative to have a firm grip. Weak wrists and clammy, sweaty hands immediately give the impression of a nervous individual, potentially with low self-esteem. Put some energy into your handshake and be confident with a solid grip, but don’t squeeze too tightly. Tight squeezes can irritate health issues such as sensitive skin, fragile bones, and carpal tunnel. The appropriate number of shakes has been a debated over the years, with 2-3 shakes accepted across the globe. Three shakes is most common, as it prolongs the handshake for an appropriate amount of time. Congratulatory handshakes are the perfect time for the double-handed approach to create a “sandwiched” experience that indicates pride, sharing, and camaraderie. Make sure that you hold eye contact with the interviewer to make a lasting impression of confidence. Also, don’t wait for a women to extend her hand first, nor should you offer a weakened grip to a female professional. Such practices are outdated and can be negatively interpreted. The handshake is a very important part of business etiquette in our society and should not be neglected. A good handshake contributes to a positive first impression and sets the initial tone for any meeting. The above tips are a great way to refine your method and ensure the development or continuation of a great professional relationship.